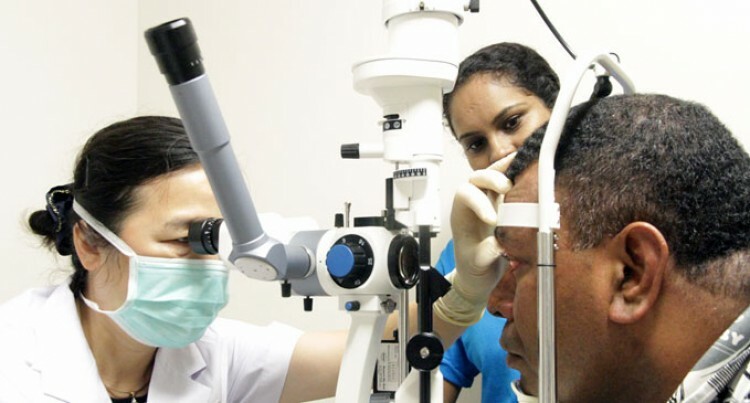 Members of the public gathered at the Pacific Eye Institute (PEI) to get their examination completed in Suva, yesterday. Experts from Zhongshan Ophthalmic Centre (ZOC), Sun Yat-sen University, China, conducted eye examinations for more than 40 people. ZOC professional doctoral supervisor, M.D. Chen Weirong said the check-up would benefit unprivileged people. “People here in Fiji are friendly. We are trying our best to help them. We will be screening some cataract patients so that we can do surgeries on Sunday. We are looking forward to conduct 30 cataract surgeries,” she said. Ministry of Health and Medical Services spokesperson Evelyn Mani said people should make use of the medical service. “10 medical experts from Guangdong Chinese Medical will be at CWM Hospital. People should visit and get their medical check-ups done,” she said. The medical check-up is expected to end at 3pm today (Sunday).